Home Budget Who is better off after the budget? The following is the speech I read out in the Dáil chamber last night. I will post the video of it soon. Tá rudaí dearfacha sa bhuiséad seo. N’fheadar cad a spreag na rudaí sin. Is ceist amháin é sin, ach tá ceist eile agam. Cén difríocht a dhéanfaidh an buiséad seo, go háirithe do dhaoine ar an imeall? The Minister spoke about the sacrifices of Irish people. There were sacrifices but they were disproportionate. There were certain groups which did the sacrificing and continue to do so, while austerity passed others by. The question is; who is better off after today’s budget? One area of particular concern to me is housing. That is because there is a crisis in Dublin Central. It is a crisis this and the previous Governments knew it was looming but they did not put enough procedures in place in time to prevent it from escalating. While there are initiatives in the budget, the question is whether they are more about property development than about solving the city’s housing crisis. Public-private partnerships did not previously deliver to the benefit of ordinary people looking for homes, and there are a number of scars in the centre of Dublin which bear witness to that. Why are the measures not coming in now on land that is already zoned and serviced, as opposed to in a few months’ time after public consultation? We are still awaiting the implementation of the Kenny report from 1973! I note the additional €10 million for accommodation and services for homeless people. I ask that a proportion of that go directly to those organisations and groups on the ground that are delivering services directly to the homeless. Tonight, it is the voluntary groups that will be on the streets of Dublin to feed the homeless and provide them with clothes and other services. Another aspect of the homelessness issue is that homeless people in addiction need roofs over their heads. While no one would dispute that, they cannot be put into the same accommodation as those in recovery from addiction. There is a major crisis in that and it will create further crises down the road. On rent control and rent supplement, there is no point in capping the latter unless something is done about the former. What is getting international attention is corporate tax. While the “double Irish” tax arrangement is being pushed away, that is happening gently, while other measures in the budget can neutralise the effect. I ask that there be transparency in relation to the 12.5% rate so that we know exactly what is being paid and collected. We should know at the very least that it is the full 12.5%. 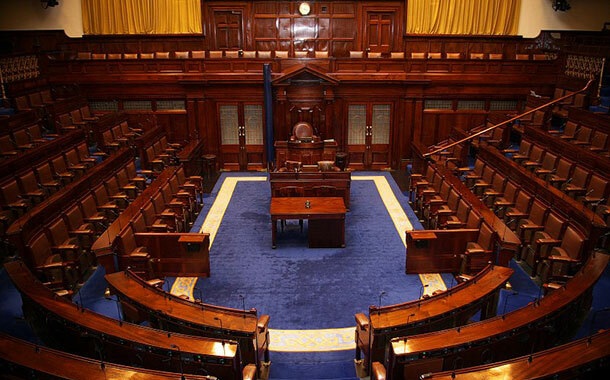 I am part of the Oireachtas mental health group, which is hoping the commitments already made in respect of services, funding and employment will be met this time and that it will not be a catch-up on previous budgets. Who has been left out of this budget? One group glaringly left out comprises young 18 to 24 year old unemployed jobseekers, particularly those from lower income sectors, some of whom have mental health issues, while others have addiction problems. Services for them suffered cumulative cuts of over 30% in the past few years. I do not begrudge the effort put into looking after the interests of farmers, small businesses and artists from the European Union, but where is the same interest for the 18 to 24 year old cohort who are becoming increasingly disaffected? I note in the budget of the Department of the Children and Youth Affairs that additional funding will be provided for the improvement of child detention centres. Where is the money to prevent young people from going into these centres in the first place? The other day I was informed by one group I had met about the increasing number of mothers forced to put their children into foster care because of the lack of housing. Has the Government looked at the cost of providing housing, as opposed to providing foster care? The increase in Garda, teacher and SNA, special needs assistant, numbers is very much welcome. However, these are increases on numbers that were cut. Accordingly, they cannot really be seen as increases because we have not gone back to the original complements.